A visit to the Diano Shipyard in Riva Trigoso creates a strange mixture of sensations. If on the one hand there emerges the spirit of tradition and amid the smell of wood the almost obsolete jargon of the old shipyards rediscovers life and meaning, on the other hand we encounter designs, lines and power that have little to do with imaginary memories of a distant and smaller nautical world: or perhaps this functional antique-modernity too, so imbued with the Ligurian nature of Diano and his personnel, is already classic, just as the things that the sea has selected over the years are classic. 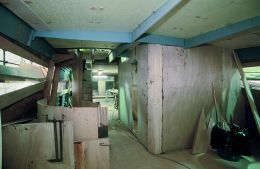 Mario Diano set up his Shipyard in 1979, deciding to build in wood precisely at a time when fibreglass had entered predominantly into the superyacht market: ".... years of easy money, they were selling boats at the price of wooden ones though they only cost a third to build. but I insisted because I came from another culture, first commanding big wooden yachts, then my work with Sangermani and with Spertini Alalunga; in a word, wood as a raison d'ˆtre. Now I congratulate myself on the choice. My boats are highly sought after, they maintain their price, they sail well, they last long. And then a detail that is not negligible for someone who already has a lot and comes to purchase a yacht of this kind: they're one-off pieces!" Mario Diano explains the specifications he needs from an owner: speed, power, layout, this in order to position the hull within the desired size range. "... if for example on a 23 metre we're building at the moment the owner had asked for only 2 x 1300 HP engines, the boat could have been 21 metres as per the original request. The decision to install 2 x 1500 HP meant lengthening the engine room and hence the boat by a metre and a half to maintain the right spaces and proportions. And then the request for the galley on the lower mid deck to keep the saloon unencumbered: where will you find this on a mass produced boat? In brief, a boat of mine is like a bespoke suit, it certainly "hangs" better than something off the peg!". Given that the group's boats - the Diano models built, to be precise, in Riva Trigoso and the Santa models in the yard at S. Margherita - are all fast planing hulls with flying bridge and lengths between 20 and 33 metres, let's take a look at how they are built. The boat's spine, the keel, at least for lengths up to 30 metres, is of the mixed type: the rectilinear part aft is in solid mahogany measuring around 230 x 200 mm. and is joined to the curve and the bow upright, constructed in laminate: the ten 20 mm sheets of which it is composed mean that the necessary curvature can be followed without inappropriate cutting of the wood fibre and without excessive waste. 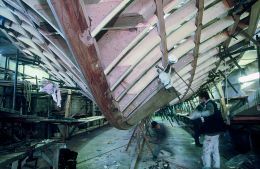 The yard's biggest vessels however - the 33 metres of the Santa 33 - require lamellate for the entire keel: the stresses of the 2 x 2500 HP engines are considerable and it is better to section and reassemble a plank in order to be sure of its perfect intactness. Mahogany is also used for the girders, the six reinforcements which run longitudinally from bow to stern, average size 150 x 100 mm, and which, suitably capped in steel, support the engines. Mahogany is again used for the shelf-pieces, the frame-floors, the coamings (the "joints") of the deckhouse and stringer and the edge of the planking between bottom and side frames. Forward, given the necessary curvature, it is in lamellate. We find lamellate again in the false keel, the wedge-shaped "fin" up to half a metre long which lends directionality and toughness. Certainly not of secondary importance is the advantage this appendage gives in limiting leeway during manoeuvres. 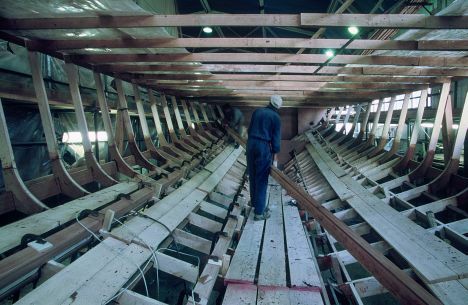 The frames, the transversal skeleton of the boat, are in ash: the positive factor lies in the high flexibility of this wood which can absorb lateral shocks without too much stress on the overall structure. Their spacing is proportional, reaching centres of 150-200 mm. at the points of greatest stress, i.e. the bottom and the forward part of the vessel. The planking is differentiated: for the bottom, a base of RINA homologated 18 mm. ply, known as "armoured" because it has double the average number of layers, is nailed to the framing and faced with a 16-18 mm. layer of solid mahogany glued with deck rubber. Heavy duty bolts with stainless steel pins, made directly in the yard, fix the whole of the planking to the girders, and the false keel too is bolted with the same system, using staggered holes to avoid weakening. The side frames are in RINA ply with the thickness increased to 20 mm., as is the transom. It should be specified that the elegant inverse transom of the Diano is in fact a panel constructed in laminate, three 6 mm. layers, whose envisaged function is shock absorption. The actual structural transom is vertical and laid on a tough mahogany frame. So double planking for the bottom and single for the sides. Here, to obviate possible scoring of screws and pins, 3 mm. ply is glued to the sides with the vacuum technique (certain parts of the furnishings are also created in this way): "... two extra weeks of work for each boat, but it's worthwhile because the finish is excellent!" Aft of the engine room a further reinforcement is glued and bolted to the bottom: 50 mm. of wood that gives the propeller supports and the boring of the prop shafts a tried and tested toughness. The teak deck and the superstructures in solid wood, ply or laminate depending on aesthetic and functional requirements, are laid on mahogany beams. The finish of the hull is obviously commensurate with the rest: three coats of West System for total impregnation of the wood, then a primer, two coats of putty with intermediate sanding down, an enamel undercoat and then a final coat of Awl Grip enamel. Given the fundamental nature of the thing we asked Diano about his relationship with the suppliers of his raw material, wood: "... I buy from Magnino Legnami of Alessandria and our relationship is very simple: I ask for prime quality wood and he gives me prime quality wood. When it's necessary I go, or send someone, to see the mahogany trunks. We select, we buy, we have it sawn and then we leave it to season up there, to suffer the cold and the bad weather, in a word to age. At the right moment, meaning when a job starts, we cut and plane and reduce the wood to measured planks, since we already have a clear idea of what they're to be used for, be it keel, lamellate, girder or whatever. The core of the trunk is not used, nor is the internal and external layer of bark. There's considerable waste: for a 24 metre boat you need about 70 cubic metres of trunk, but at least there's no problem of waste disposal; the chips go for horse litter, the sawdust for making fertilisers and the logs for the country people's stoves!". We also asked Giovanni Magnino, one of the biggest timber dealers, something about the wood in question. "... From me Mario Diano buys prime quality European ash (Fraxinus excelsior) and African mahogany (Khaya ivorensis). Mahogany was first used in shipbuilding in the 19th century for ship furniture and then planking before it was realised, on the diminution of traditional national woods, that it could be used for all parts of the vessel except the framing. With present day epoxy treatments, anti-woodworm and antifouling, there isn't the minimal risk of parasite attack, even in tropical waters. These wooden boats are so anhydrous that it is actually easy to find cobwebs in the bilges." We then spoke again with Mario Diano, asking about his immediate projects. "I've got orders for a 33, a 27 and a 20 metre, as well as the idea for an open, backed up by several customers: 30 metres, in lamellate, 45 knots. I'll try to go ahead with it even if there are some objective difficulties with municipal administrations that consequently influence planning."